For those who don’t know what November Project is, it’s a free fitness movement composed of really positive people who support each other on their fitness and running journeys. The group meets on Wednesday mornings at 5:28 and 6:28 a.m. near Gracie Mansion at 86th Street and East End Avenue in Manhattan, at 6:28 a.m. at a rotating location on Fridays, and at Wards Island (across the river via the walking bridge from 102nd Street on the east side) on the last Wednesdays of the month. Everyone cheers each other on through the strenuous workouts, which generally include about three miles of running combined with pushups, burpies, dips, squats, and core exercises. I started going about a month and a half ago because my sister, Katie, got into it through her friend, Sarah. Now I’m into it because, hey, why not wake up at 4:30 a.m. on a Wednesday to run around the City? The first Wednesday of every month is “PR Day.” PR day is a chance to gauge your endurance progress by running eight loops of a set course, which totals approximately 3.5 miles (each loop being just under half a mile). The loop starts on the greenway adjacent to the East River at 86th Street (identified as Bobby Wagner Walk on Google Maps) and proceeds north toward Gracie Mansion before turning west and up a tiny stairway with long, low-inclined steps. The loop then proceeds to the corner of 88th Street and East End Avenue, and then south to 86th and East End Avenue before turning left and running down a grotto and, at the end of the grotto, up a set of stairs that are too narrow to take two steps on each step, but too wide to take one step. Hop up five steep steps and back onto Bobby Wagner Walk, and do it seven more times. This was my first attempt at the PR course. I wondered all week if I should run the course slow, or if it would be better to get in some anaerobic training as I get closer to the NYC marathon (woohoo! super excited). I made the decision to run hard, but not at my absolute maximum, as John, one of NP-NYC’s leaders, gave the course directions. “Leave something in the tank,” I thought. “Don’t use up your reserve energy.” The sun had not yet risen. And so we started. The first fifth of the loop is downhill, so I shortened my stride and let gravity help me along. I talked a bit with Paul, the group’s other leader, but that was short-lived when he pulled away from me as we ran past Gracie Mansion and out toward East End Avenue. I would stay by myself in “second place,” if you can call it such (it’s a training run, after all!) for the rest of the eight loops. I checked my Fitbit: heart rate already at 159 beats per minute. Almost anaerobic already. As I hopped up the steps onto Bobby Wagner Walk and began my second loop, I formulated a plan for the rest of the run. I would hold at my pace for the next five laps, and on lap seven I would pick up the pace. By lap eight, if I were able to hold back throughout the run, I would be tired but able to give a final burst through the finish. I got through the second loop without any issues, and felt good when John, who calls out times when runners start their next loop, called out “5:24” for me. Loops three, four, and five were more of the same, although I felt myself slow down a bit. I might have pushed a bit too hard on the first loop, and underestimated the toll that all the steps at the end of each loop would take on my legs. I began passing some of the other runners, and when I wasn’t breathing hard I tried to yell out encouragement. I’m sure my, “Good work!” and “Keep it up!” came out more like, “Gereerrrrd wuuksfdghg” and “Kerrrep’t oomp.” Caveman compliments. Lap six felt good, and I picked up my pace as expected on lap seven. I could feel the end of the run coming, which always motivates me to push harder. “Seven more minutes and you can stop.” “Six more minutes and you’ll get some water.” Finally I hit lap eight and felt my legs kick into a higher gear. When I hit East End Avenue, my body felt light and easy, so I upped my speed and reached the steps in the grotto and took most of them in one stride each. “Twenty more seconds and you can rest,” I thought as I hit the middle of the steps. And then it was over. 22:34. Automatic PR. The sun had just started to poke its head over the horizon. It’s really beautiful on the east side at sunrise. After a short walk to catch my breath and drink some water, I stood by John and cheered on the other runners. My sister, asked me to run with her for her final lap. She had run her first two miles at around a 9:00 pace, which is a vast improvement for her and super cool. We made it through the last loop and up the steps, and she was happy that she had run well, but thought she started too fast (a common theme for the day). 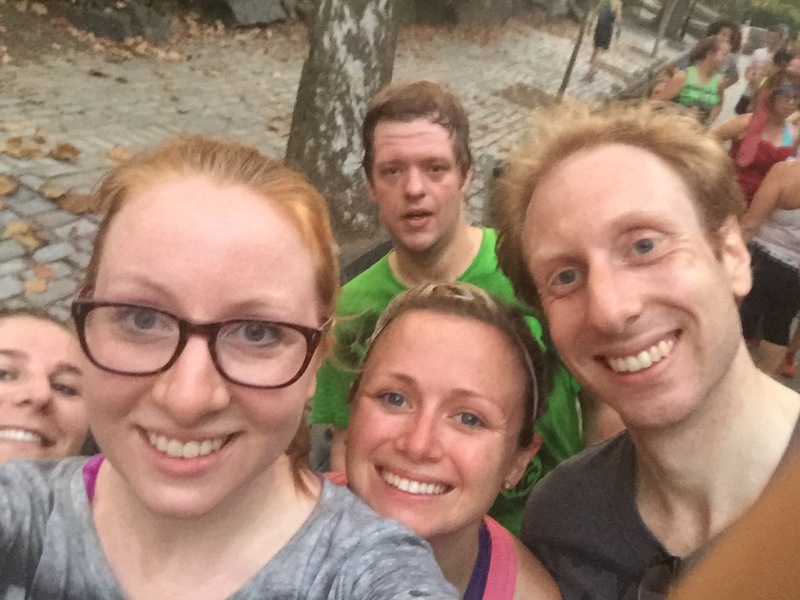 Either way, good work by everyone, and it’s so cool to run with other people who, like me, are crazy enough to get up at 4:30 on a Wednesday to run around the City. We took yearbook photos for the NP-NYC Facebook page, which I will repost here when they become available online. I look ridiculous, but that was the point! More to come on that.